When it comes to business, a London-centric mindset may have you believe that the world ends where the M25 motorway finishes. 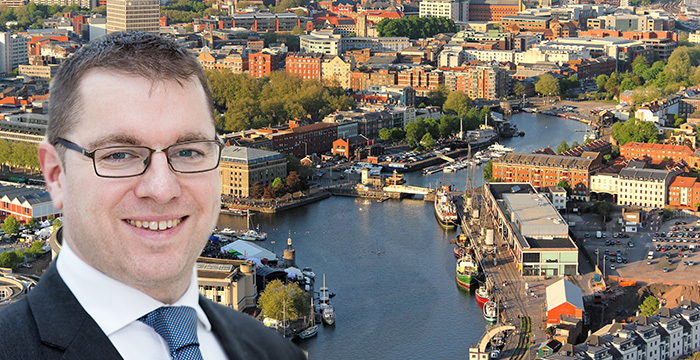 But for James Sutherland, a partner at independent UK law firm Burges Salmon, which is headquartered in Bristol, there are strong incentives for practising outside the capital. A big draw for the firm is its high quality of work, true independence and culture. Contrastingly, Bristol enjoys the “perfect balance”. Sutherland describes the city as being big enough to offer enough culture to keep inhabitants entertained, but small enough to be navigable and commuter-friendly. It’s for these reasons that Sutherland, who joined the firm just over a decade ago, finds Bristol to be “a very difficult city to leave”. With agile working on the rise, Sutherland can even enjoy the best of both Burges Salmon’s worlds. Whether he’s busy in the Bristol HQ, the firm’s London office or during the train journey in between, modern working practices mean that the litigation specialist can stay connected. Sutherland, who studied history and economics at the University of Oxford, pursued law after seeing how varied the profession was — offering little danger of eventually getting bored. After completing a Graduate Diploma in Law (GDL) and the Legal Practice Course (LPC), courtesy of the University of Law (then known as the College of Law), Sutherland moved to Bristol — not a million miles away from his home town of Sidmouth, also in the South West. Now as a partner, Sutherland works in dispute resolution and litigation, specialising in real estate and property insolvency. It’s here that his undergrad skills come in handy. While experience churning through endless history books prepared him for due diligence exercises, economic theory came in handy when unpicking clauses in commercial contracts and understanding the business consequences of the options available to his clients — setting an example to all would-be solicitors without a law degree. Having worked as a property litigator since qualifying, Sutherland enjoys working with real, physical assets — as opposed to primarily working with non-tangible assets such as debt and other financial assets. Whether it be office blocks or a person’s home, disputes are often grounded in peoples’ lives and livelihoods, which he says, keeps the work “more real, more human”. Sutherland’s practice often involves advising on disputes over development agreements. One high-profile battle pitted the local football team against Sainsbury’s, after the supermarket pulled out of a £30 million project to buy the Bristol Rovers’ stadium site. Acting for the Rovers, Sutherland recalls the case as very challenging and complex, with Sainsbury’s taking it all the way to the Court of Appeal. Sutherland identifies an “international flavour” to his practice in light of increased investment from international property buyers, which ties in with Burges Salmon’s international strategy as one of only a few truly independent law firms in the UK, delivering international work for its clients. Renewable power generation sites, he says, have become “tradeable commodities” with domestic and international investors buying up sites in anticipation of future revenue streams. Interestingly, the real estate market could be an area that might benefit from the Brexit uncertainty, at least in the short term. A weak pound — the value of sterling has drastically fallen since the 2016 Brexit referendum vote — has attracted international investors to buy up discounted UK real estate assets and may continue to do so if there are further falls in sterling. While this serves as a potentially positive aspect of Brexit in the short term, negative implications for the real estate market can, too, be identified. These largely stem from fears of a slowdown in the market or even a recession, which the UK would struggle to avoid if it crashes out of the EU without an agreement in relation to its future trading relationship. “If everyone is making money in a commercial relationship, people are more likely to perform their contractual obligations,” Sutherland explains. But where the “economy goes into reverse”, maintaining the status quo under an agreement often becomes too expensive or the asset drops in value — weakening the incentive for parties to perform obligations which might be perceived as onerous. During these hard times, Sutherland adds, there’s “less money floating around” for those in disputes to make a deal, which results in heated cases as neither party can afford to lose. As an example, Sutherland points to the European Medicines Authority (EMA), which until recently was embroiled in a court battle with Canary Wharf, its landlord. The medicines regulator, which is being moved from London to Amsterdam, argued that Brexit is an unforeseen, frustrating event, and should allow it to pull out of its £500 million office lease. However, the High Court ruled this week in favour of Canary Wharf, meaning EMA is still bound to its lease, which has 21 years left to run. For aspiring lawyers hoping to specialise in real estate and insolvency, Sutherland recommends making that preference clear during your training contract. Trainees are often exposed to these areas during their seats and have plenty of opportunities to specialise, he says. Until then, taking an interest in the real estate market, understanding how it works and scrubbing up on land law won’t go amiss. James Sutherland will be speaking alongside lawyers and industry experts from RPC and Womble Bond Dickinson at tomorrow’s Secrets to Success careers event at The University of Law in Bristol. You can apply for one of the final few places to attend the event, which is free, now.